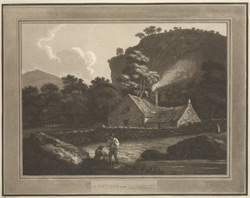 View of a cottage near Llanrwst in the Conway valley in Northern Wales. The town is situated on the eastern banks of the Rover Conwy, four miles to the north of Holyhead. The town famously considers itself independent from the United Kingdom because it was made a free borough by Llewelyn in the 13th century and ever since has borne the motto ‘Cymru, Lloegr a Llanrwst’, this means ‘Wales, England and Llanrwst’.